Second-ranked Lawrence Free State gets its biggest test of the season to date when the Firebirds hit the road to take on No. 5 Shawnee Mission East. Free State opened the season with consecutive shutouts of Olathe West, Olathe East, and Shawnee Mission North. The Firebirds then struggled with penalties in the first half before rebounding to beat Shawnee Mission West, 35-14. Since, the Firebirds have shutout Sedalia-Smith Cotton (Mo.) and trounced Olathe South, 54-13, last week. Senior running back Jax Dineen is a load to bring down for the Firebirds. After an all-state junior season in which he rushed for more than 1,500 yards and 23 touchdowns, Dineen has already rushed for 770 yards and nine touchdowns on only 62 carries this fall. That works out to 12.4 yards per carry. Wide receiver Keenan Garber has been equally explosive. Garber, a Kansas State commit, has scored 13 touchdowns on 24 offensive touches. That means that Garber scores a touchdown nearly 55 percent of the time he touches the ball. On the season, Garber has been quarterback Malik Berry’s favorite target. Garber has 19 receptions for 452 yards and ten touchdowns. He has also rushed five times for 51 yards and three scores. Berry has completed 54 percent of his passes for 640 yards and 11 scores. Shawnee Mission East has won five straight games since a season-opening loss to Gardner-Edgerton. The Lancers have posted solid wins in the last three weeks in defeating Shawnee Mission Northwest (37-7), Shawnee Mission South (35-18), and then No. 4 ranked Olathe North (35-28). Last week, the Lancers used a goal-line stand and a 99-yard time-consuming drive to beat Olathe North. With the game tied at 28 in the fourth quarter, the Lancer defense came up with a goal-line stand to hold the Eagles out of the end zone. Shawnee Mission East then went on an 18-play, 99-yard drive that resulted in a 1-yard sneak from quarterback Andy Maddox with 20 seconds remaining to put the Lancers up 35-28. Olathe North then threatened with a long pass play to the Lancer 12-yard line with time for one final play. That play was a fade pass that fell incomplete in the end zone. Linebacker Tyler Stottle leads a Lancer defense that is giving up less than 16 points per game. Maddox, the son of former Kansas basketball captain Mike Maddox, guides the Lancer offense. Shawnee Mission East has averaged more than 35 points per game. Shifty running back Tony Friends leads the Lancer ground attack by averaging more than 100 yards per game. Shawnee Mission East will likely need to limit the big plays from Dineen, Berry, and Garber to have a chance at pulling the upset. While the teams haven’t met since 2015, Free State has won the past two meetings at the Shawnee Mission North Stadium – the Lancer’s home. Perhaps the most anticipated game of the 2018 regular season, Bishop Miege travels to St. Thomas Aquinas with the Eastern Kansas League championship on the line. The Stags, ranked No. 1 in Class 4A, had their 29-game win streak stopped two weeks ago with a 14-13 loss to Missouri power Rockhurst. Miege’s last loss to a Kansas team came to Blue Valley, 35-28, to open the 2016 season. Last week, Bishop Miege rebounded by beating Blue Valley, 29-15, in a sluggish game that featured ten total turnovers. The Stag offense has been without a couple of its primary playmakers in junior receiver Daniel Jackson and classmate Brison Cobbins. Jackson was lost of the season with a knee injury in the season-opener, while Cobbins, the team’s leading rusher, left the Rockhurst game with an injury and didn’t play last week against Blue Valley. Even without those two, the Stag offense remains explosive. Quarterback Sam Pedrotti has passed for 986 yards and seven touchdowns on the season. Sophomore receiver Phillippe Wesley has 22 receptions for 432 yards and three scores, while Hudson Bentley has emerged to grab 25 passes for 420 yards and two scores. DeAunte Parker led Miege in rushing for 69 yards in last week’s win, while Jaylen Scruggs also took a pitch 61 yards around right end for a touchdown. The one constant has been the Miege defense, which may be the best Jon Holmes’ has had in recent years. Last week, the Stag defense stuffed Blue Valley on four tries from the 1-yard line in the third quarter to preserve a 21-13 lead. Dylan Downing leads the group from his linebacker position and averages double-digit tackles per game. Defensive end Jalen Williams has 9.5 tackles for loss and 7.5 sacks. The Stag secondary intercepted Blue Valley quarterback Walker Kinney six times last week – two each from Scruggs, Rishi Rattan, and TyQuez Agnew-Whitten. Meanwhile, St. Thomas Aquinas is unbeaten thanks to a potent ground game that averages more than 380 yards per game. The Saints’ offensive line has been dominant and thought by many to be the best that Randy Dreiling has ever had. Up front, the Saints are led by Oklahoma State commit Joe Michalski (6-5, 280), while sophomore giant Jaeden Roberts (6-6, 320) joins him on the right side. Center Tommy Tholen, Dionte Brown, Jack Johnson and tight end Jack Gabel round out the group. That group has led way for the emergence of sophomore Tyron “Tank” Young. Young has burst onto the Kansas high school football scene with 1,147 yards and 16 touchdowns in just six games. Tank is averaging 10.7 yards per carry. Cameron Jackson has carried 31 times for 359 yards, but earned Kpreps all-state honors last season with 1,414 yards and 19 touchdowns. Quarterback Tate Raboin directs the Saints offense. Raboin has passed for 602 yards and seven touchdowns this season with only one interception. He’s coming off of his best passing performance of the season – a 159-yard effort with three touchdown passes in last week’s win over St. James Academy. Bishop Miege has won six consecutive games in the series with the last Aquinas win coming in 2012 – a year where the schools split two meetings. That year, Aquinas won the regular season matchup 27-24, and Miege won 9-7 in the playoffs to send the Stags to the state title game a week later. Is this the year Aquinas beats the Stags? Miege has been a little beaten up on offense, but the Saints will need to avoid turnovers and control the line of scrimmage to get the win. A key Ark Valley Chisolm Trail Division I matchup with significant league and Class 5A ramifications. Salina Central is arguably the state’s biggest surprise at 5-1 after it entered the season on an 18-game losing streak. The Mustangs have only lost to Derby, ranked No. 1 in Class 6A, in Week 2. Maize faces the top-ranked Panthers next week. The two teams have played very similar schedules – and taking out the 63-0 Derby loss – have similar results. Maize has a collective total of 233-9, while Central has a total margin of 214-66 minus the Derby contest. First-year coach Mark Sandbo has turned around the program mainly behind senior running back Taylon Peters, the state’s leading rusher with 1,305 yards. Maize has countered with Kansas’ top scoring defense with just nine total points allowed. The Eagles opened the season with four shutouts and then allowed a safety in Week 5 and a first-quarter touchdown in a blowout win versus Salina South last week. Last Friday, Salina Central defeated Newton, 33-19. Peters tallied 304 rushing yards and five scores. Maize senior quarterback Caleb Grill, one of the state’s top basketball players and a South Dakota State commit, has passed for 851 yards. He has also emerged as one of Kansas’ best punters. In the last five games, Maize has punted 15 times for an average of 42 yards a punt. The Eagles have also been superb in the return game. Maize’s defensive strength comes in its collective quickness and chemistry. While several opponents have actually ran more plays than Maize in games this season, the Eagles are known for limiting the big play, especially in the passing game. Even last week, Salina South had 59 plays, eight more than Maize, but the Eagles held a 338-191 edge in total yards. Maize has been terrific on third and fourth down, too. Overall, teams are 61 of 123 passing for 449 yards with a 0/4 TD/INT ratio. Maize has permitted 107 rushing yards a game but just 2.95 yards per carry. The Eagle defense has forced teams to convert just 23 percent of third downs and 18 percent of fourth downs. Maize has forced 13 turnovers with a plus-six turnover margin, but the offense does have all seven turnovers in the last four games. Senior defensive lineman Noah Stanton and senior safety Tanner Ohmeis are among the returners and key players. Salina Central has averaged 35.7 points per contest and is one of six, 5A squads to exceed 200 total points thus far. It will be the best offense Maize has faced this season. Of the first six opponents, Campus had the best scoring offense in games where they did not play the Eagles at 29.8 points a game, while one-loss Goddard was at 27.4. Salina Central has enjoyed a fine season and could very well pull the upset. Expect Peters to have another big game, but Maize’s defense/special teams and play on key downs swings the advantage to the Eagles. This is one of multiple matchups this week featuring a non-ranked team enjoying its best start in years against a ranked foe. Colby, under second-year coach Rees McKinney, a Scott City graduate, is 6-0. The Eagles have made multiple positional changes after a 4-0 start last year ended in a 6-4 season that included a pair of losses to Holcomb and one to Scott City, all by at least 27 points. Both teams are 3-0 in district and the winner is expected to take the District 8 championship and the GWAC title. Scott City has joined Andale and Pratt has utterly dominant 3A teams. The Beavers have outscored opponents 278-19. Colby is at 248-82 against a similar schedule. They are two of seven undefeated 3A squads left. Colby standout senior Jordan Schippers moved to quarterback and has led the offense, including a 38-34 comeback win versus Holcomb in Week 3. The win ended a nine-game losing streak to the Longhorns. Colby moved players in the backfield and on the line, too. Senior Calvin Stapp has again played well in all three phases, and senior end Xavier Slaven has put together great back-to-back years. Stapp has picked off four passes on defense and has 632 rushing yards. 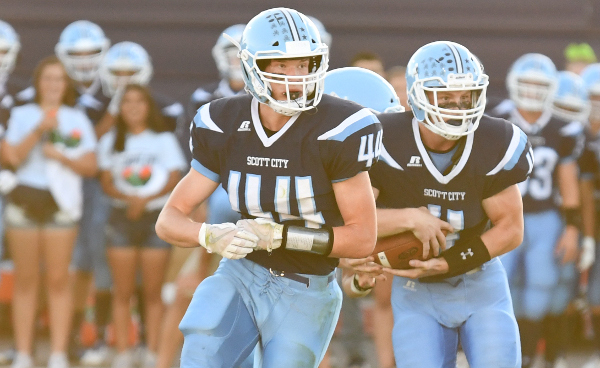 Scott City enters the contest with 31 straight district wins, according to Western Kansas News, and has started at least 6-0 for the 13th time in the last 15 years. Last week, Scott City travelled to Beloit on Thursday and earned a 55-12 victory. Earlier in the season, Scott City controlled the game in a 24-0 road win versus Holcomb. Colby won at Beloit, 39-14 in Week 4. Against Beloit, Wyatt Hayes had 20 carries for 174 yards and a career-high five rushing scores. Hunter Yager had 67 rushing yards and score. Parker Gooden finished 11 of 15 passing for 194 yards with a touchdown. The receiving corps is deep with Brandon Winderlin, Parker Vulgamore and Marshall Faurot. Hayes has cleared 850 rushing yards this fall. Scott City’s defense has permitted just 109 total yards a game. Colby has ended long losing streaks versus league foes Ulysses and Holcomb in McKinney’s tenure. A road win Friday would have significant ramifications for league, district and Colby’s spot in a loaded Class 3A. While the Eagles are very skilled and have multiple all-state caliber players, Scott City’s talent and athleticism across the board leads to a victory. Perry-Lecompton visits Topeka Hayden in a Class 3A showdown that will decide the District 3 champion. The Kaws and Wildcats enter Friday’s matchup with identical 3-0 district records. Expectations were high for Perry-Lecompton (5-1) entering this season with 13 total starters back from last year’s 7-4 squad that lost to eventual-champion Sabetha in the second round of the 3A playoffs. The Kaws enter this matchup with a 35-33 loss to Sabetha as the only blemish on their record. Perry-Lecompton is led by senior standout Dalton Kellum. Kellum (5-11, 185) leads the team with 1,065 rushing yards and 15 touchdowns. He’s topped the 100-yard mark in every game this season except a 52-18 win over Wellsville when he carried eight times for 73 yards and two scores. Kellum also splits time with sophomore William Welch as the Kaws quarterback. Kellum has completed 61 percent of his passes for 426 yards and five scores, while Welch has added 235 yards passing and three scores. Senior Colton Mallonee leads the team with 19 receptions for 280 yards and three scores, while Shane Quinlan is second with 185 yards and three touchdowns while averaging 23 yards per catch. The Kaws defense is led by sophomore Hayden Robb and junior Grant Roush who have registered 68 and 66 tackles, respectively. In the loss to defending-champion Sabetha, the Kaws fell behind 35-19 in the fourth quarter before Kellum broke a 68-yard touchdown to pull within 35-27, then scored with 57 seconds remaining to pull within 35-33. The Kaws went for the two-point conversion, but Welch’s roll-out pass intended for Mallonee was knocked down by a Sabetha defender. Topeka Hayden enters this matchup having won three straight since a pair of losses to Centennial League opponents. The Wildcats opened the season with a 55-3 thrashing of Topeka West, then were shut out by rival Topeka Seaman. Hayden then fell to Class 6A Washburn Rural, 33-17, the following week. In district play, the Wildcats have allowed 13 total points. The defense has been stout all season, surrendering only 10 points per game. On offense, Brady Bohannon has made a solid transition from linebacker to quarterback and thrown for 739 yards and six touchdowns while completing nearly 60 percent of his passes. Sophomore back Desmond Purnell leads the Hayden ground game with 280 yards and is averaging nearly 5.5 yards per carry. Purnell’s classmate Trey Pivarnik is Hayden’s leading receiver with 20 catches for 324 yards and four scores. These two teams haven’t met on the football field since the 2008 Class 4A championship game won by Hayden, 42-21. The Wildcats and Kaws both have defeated Santa Fe Trial by an identical score of 28-6. Both teams have also defeated Jefferson West – Hayden 30-7, while Perry-Lecompton beat the Tigers 24-13 last week. In that game, Kellum threw a season-high 17 times for 189 yards. The Kaws may need that kind of balance again this week to crack the Hayden defense. Two Central Plains League rivals, both ranked in the top-5 in Class 2A, match up to likely decide the top two spots in loaded District 6. Chaparral has defeated Conway Springs twice in school history, but both of those wins have come in the last four years. The Roadrunners were considered among the western favorites in the summer but lost key four-year starting linemen Issac Helms (injury) and Miguel Gerber (personal). Helms did return after the first game as Chaparral has worked its way back into the top-five. In some order, Phillipsburg, Silver Lake and Conway Springs have held the top-three spots in the class all fall. Humboldt leads the classification with 343 points, while Silver Lake, Chaparral and Cimarron are tied for second with 280 points. Conway Springs has scored 266 and allowed 77, while the Roadrunners have permitted 101. The teams have played virtually the same schedule. Conway Springs has been tested in three good games in home wins in Weeks 2-4 against Cheney (28-7), Kingman (38-21) and Hutchinson Trinity (22-8). Chaparral defeated Kingman 49-23, beat Cheney 42-14 and held off Garden Plain, 30-21 at home last week. The Roadrunners play Hutchinson Trinity on the road in Week 8. Chaparral has again had a balanced offense with 166 passing yards a game and 229 rushing. Senior Jake Burke has delivered a strong year with 54 of 111 passing for 885 yards and a 15/4 TD/INT ratio. He leads the team with 66 rushes for 532 yards and 10 scores. Senior Jarrett Shelton has 61 carries for 524 yards and seven TDs. Shelton and senior Quinton Pfaff have each hauled in six receiving scores, and Pfaff leads with 22 catches for 417 yards. Chaparral has recovered an amazing 14 fumbles and is plus-12 in turnover margin. The senior-laden line has received strong blocking from Helms, senior Jaden Eslinger and Cauy Thomas. The offense has averaged 7.6 yards per play. Junior Iverson Bello leads with 74 tackles. Last season, the Roadrunners were just plus-4 in turnover margin and averaged 7.3 yards per play. Conway Springs has again had a big run-heavy offense. Last week, the Cardinals defeated Whitewater-Remington 68-20, though had just a 363-327 edge in total yards. All of the Cardinals’ yards came on the ground, and Conway Springs finished plus-four in turnover margin. Collin Koester attempted just one pass and rushed eight times for 176 yards and four scores. Zach Mercer, Cole Schulte, Jack Ebenkamp and Aaron May intercepted passes, while Heath Hilger delivered 1.5 tackles for loss. Senior running back Chase Ast (6-foot, 230 pounds) is one of the state’s strongest pound-for-pound players. Earlier in the season in the strong test against Trinity, Conway Springs was outgained by 38 yards but again had a plus-four turnover margin. Conway trailed 8-0 early but had a pair of touchdown runs from Payton Winter. Chaparral has moved up and down with big one-year win swings the last several seasons, and the Conway Springs’ game has often encapsulated the Roadrunner turnarounds. In ’13, Conway Springs won 55-23, as the Roadrunners were 4-5. The next year, Chaparral finished 9-2 and beat the Cardinals, 27-19. In ’15, the Roadrunners slipped back to 6-3 and lost 40-16 to the Cardinals. In ’16, Chaparral returned to nine victories and beat Conway Springs, 33-8. Last year, Conway won 53-19 as the Roadrunners took a three-win drop. In ’16, the Roadrunners threw for 211 yards and rushed for just 110 en route to win against Conway. Last year, Conway Springs led 45-0 at halftime and limited Chaparral to 5 of 13 passing for 103 yards. Chaparral’s Burke has stepped up as a passer, and it’s unlikely Conway Springs can again pull a big turnover margin again. The Roadrunners pull the upset.